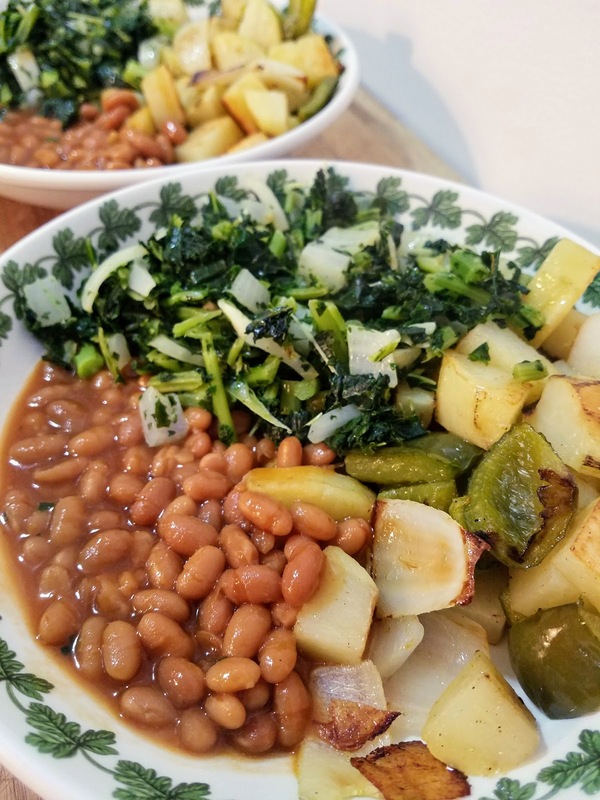 There are always those days when it seems like you have no ingredients, and you have to make a miracle happen to make dinner. Today was one of those days. 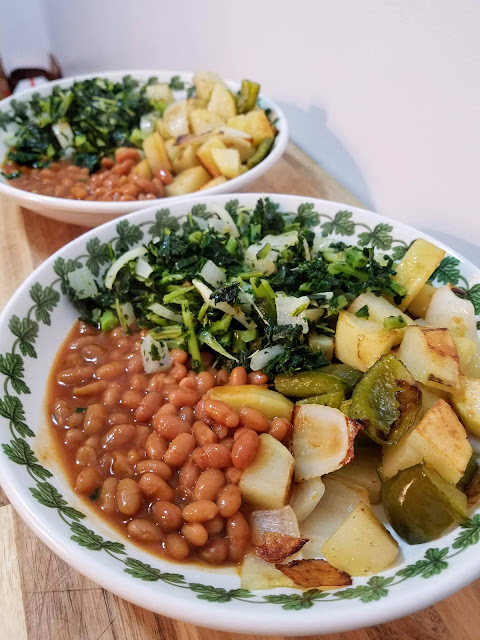 I couldn't quite figure out what we should have for dinner, so we had a hodge podge of delicious things, and lucky for me, they all went perfectly together! 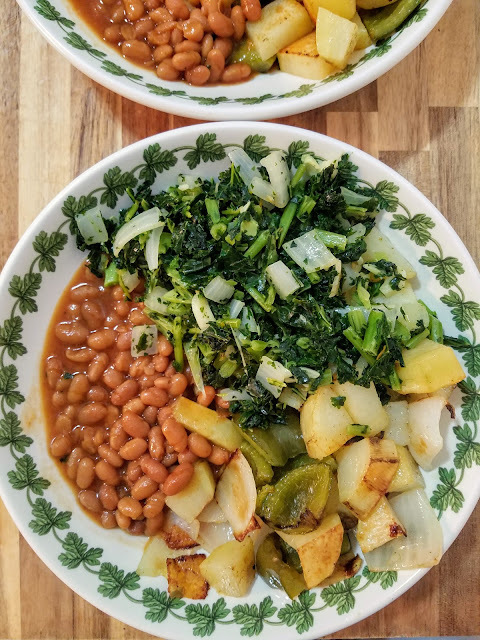 Firstly, we had roasted potatoes that were jazzed up with some chopped green pepper and onion. Our protein was a can of baked beans, which were absolutely delightful (they should probably be classified as dessert, not dinner!). The health-conscious part of the meal was some simple sauteed kale, made from the bag of frozen kale that I keep on hand in the freezer ever since this revelation. It seems that I do my best work when posed with a challenge like this. I'm always amazed with what I can come up in the face of such few options. It goes to show that you shouldn't give in and just order takeout so easily. Chances are, you have a wonderful and nutritious meal somewhere in that cupboard and freezer. Happy experimenting! Preheat oven to 375 degrees. Place cubed onion, potatoes, and pepper on a baking sheet. Drizzle generously with olive oil and salt and pepper, and then toss to coat. Put in the oven and roast for about 20 minutes, tossing with a spatula half way through. 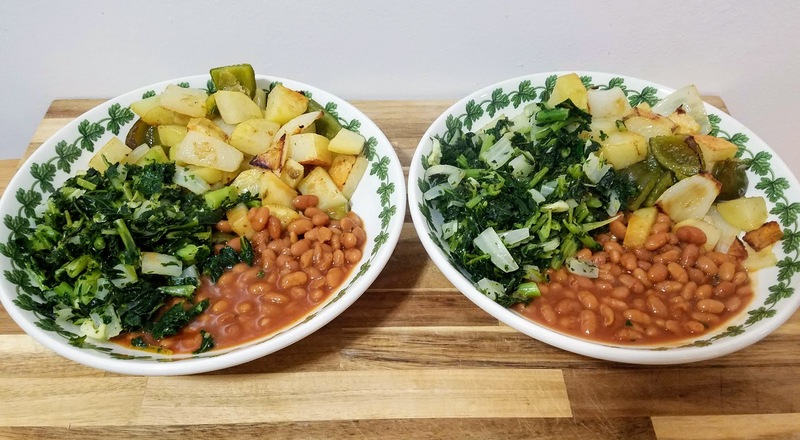 Meanwhile, open can of beans and pour in a saucepan, and heat over medium until warmed through. In a skillet, saute chopped onion and garlic in 2 Tbsp olive oil over medium high heat until fragrant and slightly softened. Add frozen chopped kale, sprinkle with salt and pepper, and stir. Reduce heat to medium low and let sit for about 5-10 minutes, stirring occasionally. 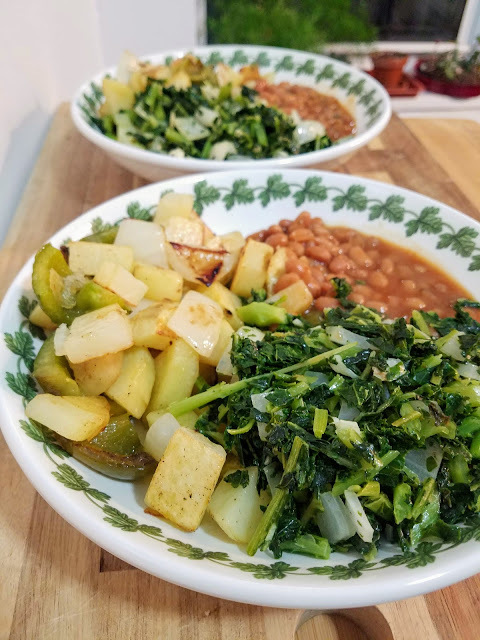 Once the kale is warmed, beans are bubbling, and potatoes are browned and crispy around the edges, you're ready to serve!